Within South Australia the maximum default speed limit outside a built-up area is 100km/h. 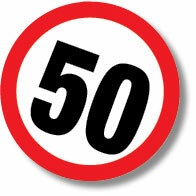 The maximum default speed limit in a built-up area is 50km/h. Unless a road sign or a licence condition indicates otherwise, these are the maximum speeds at which you are allowed to drive. Driving above the speed limit is illegal, because it creates unacceptable safety risks. Travel speed affects both the risk of a crash happening and the severity of any injuries in a crash. Even small increases in vehicle speed significantly impact on road safety risks. Speeding can be compared to driving under the influence of alcohol. Every 5km/h increase in speed in a 60km/h zone is equal to an increase in 0.05 in BAC. Speeding and inappropriate travel speeds are estimated to directly contribute to around a third of fatal crashes on South Australia's roads each year. Also, speeds just 5km/h above average in urban areas and 10km/h above average in rural areas are sufficient to double the risk of a casualty crash. For a fit and alert driver, in good driving conditions, at 60 km/h it takes about 3/4 of a second or 12 metres of travel for you to realise that you have to brake and at least another 20 metres to stop. At higher speeds, the distance will be even greater. In good clear driving conditions, you must drive within the posted speed limit however in certain circumstances, driving at the speed limit for that road can be dangerous. Conditions such as bad weather, heavy traffic, encountering children or pedestrians may require you to reduce speed to suit those road conditions. If you keep your speed down, you will have more time to avoid crashes and will reduce the seriousness of any injuries or damage. You may also save a life - possibly yours. You must only drive at a speed that would allow you to stop your vehicle within the distance that you can see ahead. The 'following distance' is the space between your vehicle and the vehicle immediately in front. This distance varies, depending on the speed you are travelling and the braking ability of both your vehicle and the vehicle in front. The acceptable minimum following distance, which is considered reasonably safe, is the distance your vehicle will travel in three seconds. This distance - about eight or nine car lengths at 60 km/h - allows you time to glance at mirrors, signs, side roads and vehicles further ahead while maintaining a sufficient safety space should the vehicle ahead suddenly brake. To estimate the following distance, use the time lapse formula, which applies for any travel speed. Allow three seconds to pass between the time when the rear of the vehicle ahead passes some stationary object, for example a signpost, and when the front of your vehicle reaches that point. To estimate that time, as the rear of the vehicle ahead passes the selected point, count... 1001, 1002, 1003 and your vehicle should not have reached that point before that time. when the road is unsealed. The distance a vehicle travels from the time you see an event occurring to the time the vehicle is brought to a stop is called the total stopping distance. Reaction distance (or thinking distance) is the distance travelled by a vehicle while the driver realises the need to brake and actually starts to physically apply the brake. 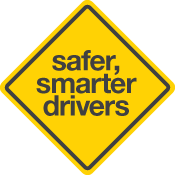 For a fit and alert driver, it would average about 3/4 of a second or 12 metres at 60 km/h. If you double the speed, you double the reaction distance. Note that you can reduce your reaction distance by scanning the road ahead to anticipate potential problems. If you notice a driver in front of you driving erratically or waywardly, moving your foot to 'cover' the brake pedal will reduce your reaction time if sudden braking is required. Braking distance is the distance travelled by the vehicle once the brakes have been applied. The braking distance increases if the road is wet, slippery, uneven or unsealed. The braking distance increases when going downhill because of the effect of gravity. The braking distance for heavy vehicles, including buses, is much greater. Take extra care when changing lanes to move in front of them. The braking distance increases at a greater rate than the increase in the speed you are travelling - if your speed doubles, your braking distance will increase by four times (2 x 2); if your speed trebles, your braking distance will increase by nine times (or 3 x 3). For example, if your vehicle travels 20 metres in braking to a stop from 50 km/h, at 100 km/h it will take approximately 80 metres to come to a stop on the same road surface (i.e. 4 x 20 metres). Approaching a corner or bend too fast may cause you to lose control of your vehicle. You should brake to a safe speed before entering the corner or bend because the vehicle will remain more stable and controllable if braking is done in a straight line. Heavy vehicles need a long distance to stop. So if the traffic lights turn red and a truck or bus is approaching don't pull into their lane because this reduces their stopping distance. Likewise, in flowing traffic a heavy vehicle may be trying to keep a safe distance from the vehicle in front, and if you cut in front of the heavy vehicle it may not have enough room to stop safely.